He'll look stylish wearing this classic boys navy blue short-sleeved top by Burberry with a smooth cotton button down collar and the designer's beige new classic check. Complete the look with a matching pair of boys beige cotton twill shorts, by Burberry, made with the designers new classic check. 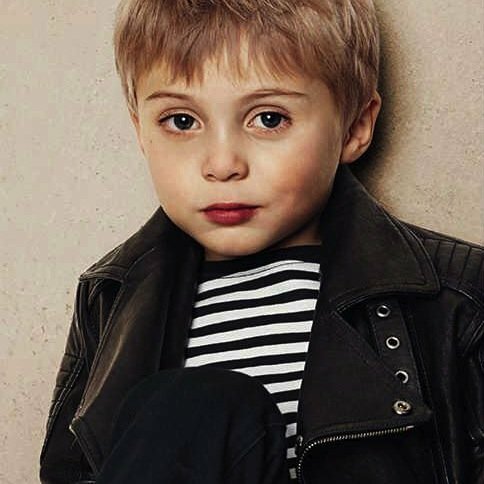 Adorable mini me look for boys inspired by the Burberry Men's Collection featured on the runway at London Fashion Week. Love this classic navy blue short-sleeved polo shirt by Burberry for boys, made from soft cotton piqué jersey, with a smooth cotton button down collar. The collar has the designer’s beige new classic check, it fastens with buttons and has the ‘Equestrian Knight’ embroidered on the chest.